A Quote-Come with me, I just want to go home. Description-Well built and lithe with reddish-blond hair. Dressed in black with sunglasses and a staff. Persuasion:6D, Search 6D, (SP) Tracking:9D, Sneak:7D. or above him. Murdock can perform a Full Defensive Skill Use and still attack or use another skill. (He cannot do a Full Dodge and Full Parry at the same time though). gets -2D when in rain, snow or a crowd, -5D in heavy rain, snow or a big crowd. listening to their heart beat. Limitation: Sound-based attacks are +2D against him. He can track by smell and can detect certain odors. He is very good at recognizing people and chemicals by smell (successful Know roll). Gasses and toxins are +2D against him. His sense of touch is so sensitive he can read newsprint with his fingers . Murdock gains +5D to Search or Track when he employs all his enhanced senses. Blindness: Murdock cannot make a PER roll that involves sight. Billy Club (STR+2D; throwing range: 0-6/10/30; 30 meter swing line). As a teenager Matt Murdock was struck in the eyes by material from a radioactive cannister while saving an old man from being hit by a truck. Blinded by the incident, Murdock found that his senses had been magnified to superhuman levels and that he had acquired a "radar" sense that gave him a 360 degree three-dimensional view of his surroundings. His father, an aging boxer, made Matt promise to do well in school so that he wouldn't have to live by his fists. Matt was an excellent student, both before and after the accident that blinded him. He eventually became one of the best lawyers in the country. Daredevil has a profound love of justice and the justice system, and works hard at making it work better rather than just scrapping it. 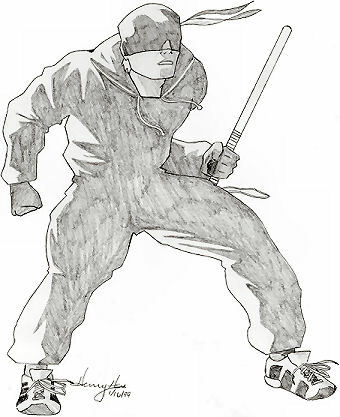 However, as the vigilante Daredevil, he often has to work outside the law which has created some conflicts for Matt. The only weapon he regularly uses is his billy club which also has a cable allowing him to swing from building to building in Hell's Kitchen (the lower east side of Manhattan) where he's appointed himself protector. Matt Murdock and his friend Peter Parker were kidnapped from Earth and used as a pair of 'bounty hunters' being told that they would never go home and would die if they failed to help retrieve the Mutt Squad. It was Matt Murdock who finally managed to communicate with the members of the Mutt Squad and it was with the Squad's help that they were able to return to earth. A couple of years later the Mutt Squad returned to Earth to help fight off an Imperial invasion of the planet and Matt and Peter were both members of the resistance force.